‘Red Farm’ sounds like a Maoist agricultural collective where exiled bourgeoise are forced to hunt sparrows as part of their re-education, but it’s actually the name of a Chinese restaurant in Covent Garden. 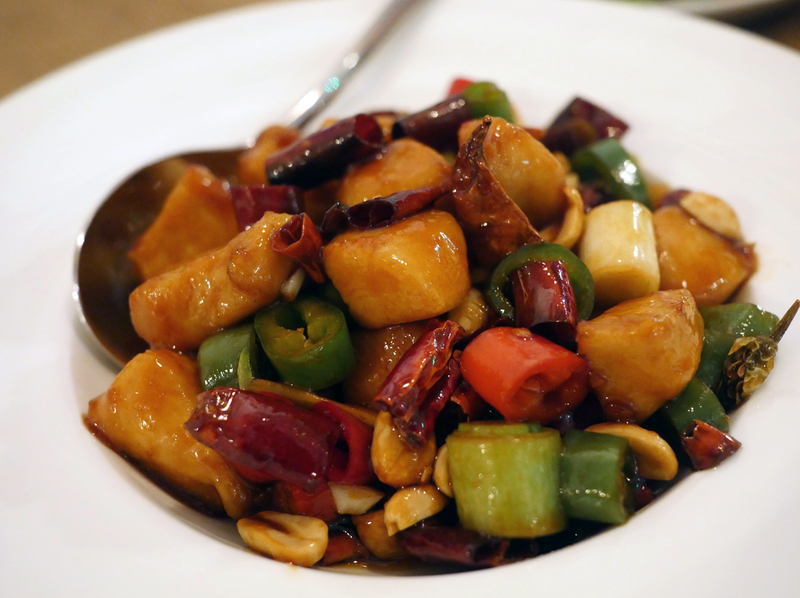 It’s quite unlike any other Chinese restaurant in London though, and not just because it’s a London version of a New York original. Many Chinese restaurants tend to overemphasise their Han-ness and non-Western credentials, from decor and the exclusive use of Chinese waiters to the use of Chinese terms and script on menus, even when or perhaps especially when the food is nothing more than the usual anglicised lemon chicken pap. Red Farm eschews all of that. 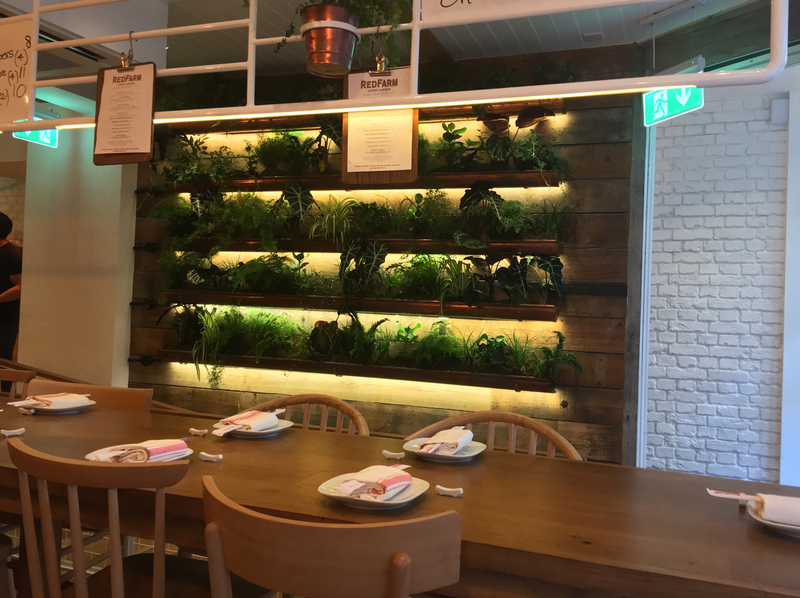 The decor of bare wood, gingham and hanging planters – a far cry from the usual imperial or Maoist chintz – looks as though it’s been lifted from a garden centre. There’s barely a Chinese staff member to be seen (the service, while rough around the edges, is still a friendly world away from the brusque Chinatown standard) and there’s an almost total absence of Chinese names and terms on the menu. 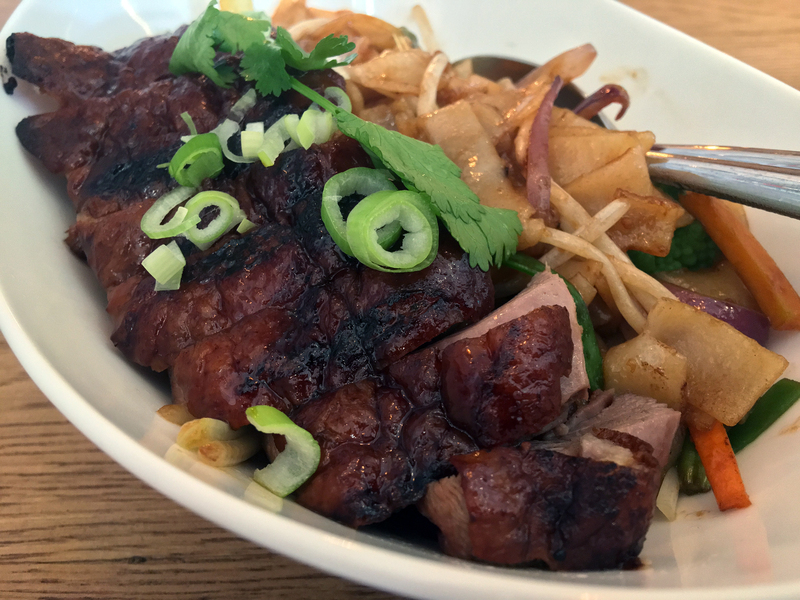 It’d be tempting to think that Red Farm’s food is therefore on a par with the bain-marie gloop found in a theme park’s pan-Asian canteen, but that’s far from the case. There are some resolutely traditional dishes alongside some cleverly inventive crowd pleasers which, if nothing else, gives Red Farm a distinctive identity. 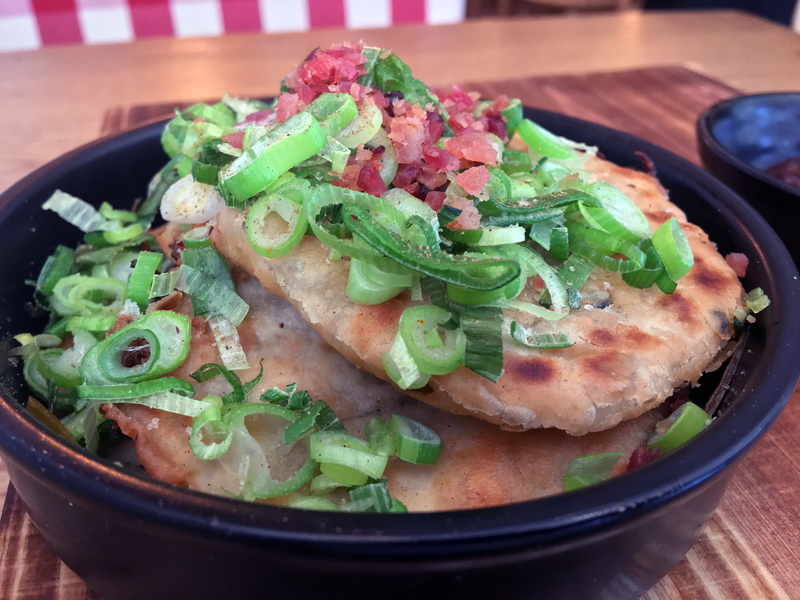 Scallion pancakes are a classic yet underappreciated dish. Here, the crisp and chewy carb sheaves had been given a porky boost in the form of smoky bacon bits. Adding bacon is classic cheating, but I don’t really mind when the bacon compliments the chewy and equally smoky scallions so aptly. 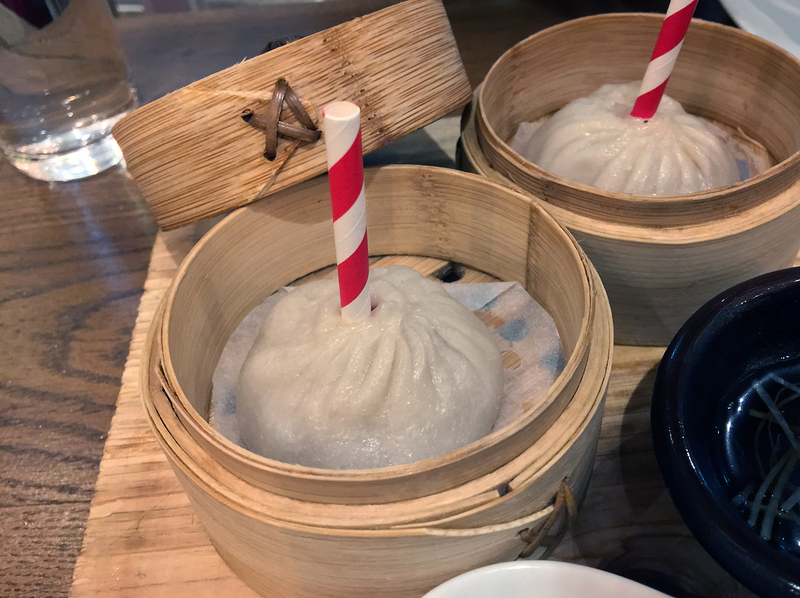 Xiao long bao are pierced with straws to help prevent soup dumpling neophytes from spraying themselves, and their loved ones, with hot soup as they pierce the thick and supple dumpling skins. Don’t take this handholding as a sign of culinary ineptitude though, as these were easily some of the best xiao long bao that I’ve ever eaten. I’m not sure what exactly was the source of the crab and pork filling’s addictive, meaty umami – the soup, the ground meat or both of them in concert together. Regardless, these xiao long bao were more delicious than the various varieties I had at the Taipei 101 branch of the feted Din Tai Fung. I can’t think of praise higher than that. Din Tai Fung is finally opening a London branch, but their xiao long bao thunder may have already been stolen. Ho fun rice noodles topped with slices of Cantonese-style roast duck is a classic Chinatown cheap eat. Red Farm’s version is more than good enough to prevent you from decamping to Four Seasons. Wide, supple and grease-free noodles were topped by breast pieces blessed with slippery skin, a bold smoky sweetness and a neatly rendered rim of fat leading to reasonably moist meat. There was a bit too much carrot and beansprout filler, but this was the only flaw (and a minor one at that). The only good duck is a dead tasty duck. 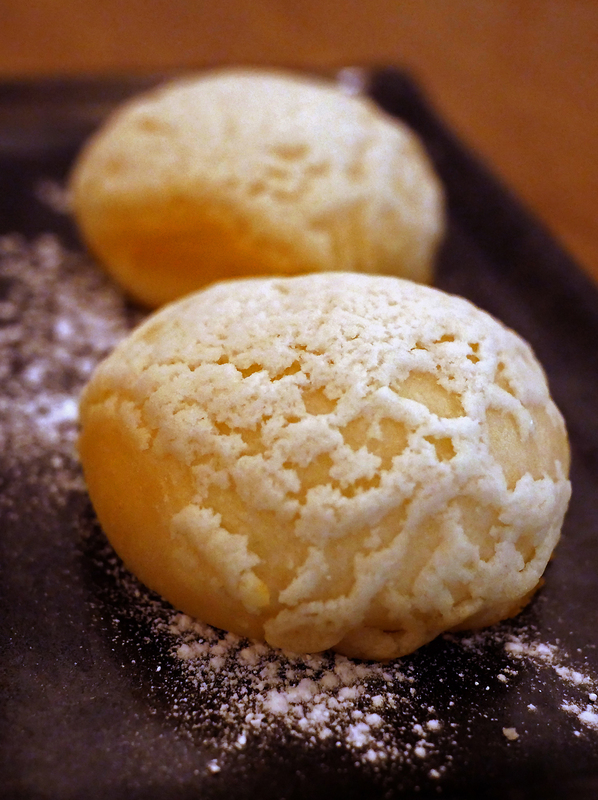 Red Farm’s custard bao looks unassuming, but it shouldn’t be overlooked. 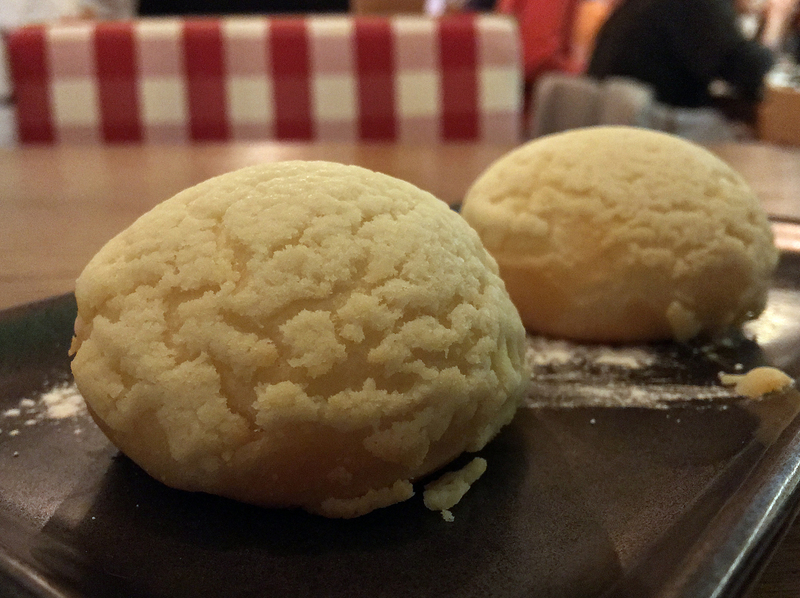 The thin, delicately crisp crust gave way to a fluffy, gently doughy cushion filled with thick, eggy sweet custard. These little bundles of joy wouldn’t be out of place in a Kowloon bakery. This isn’t the last time you’ll be seeing these little beauties in this review. 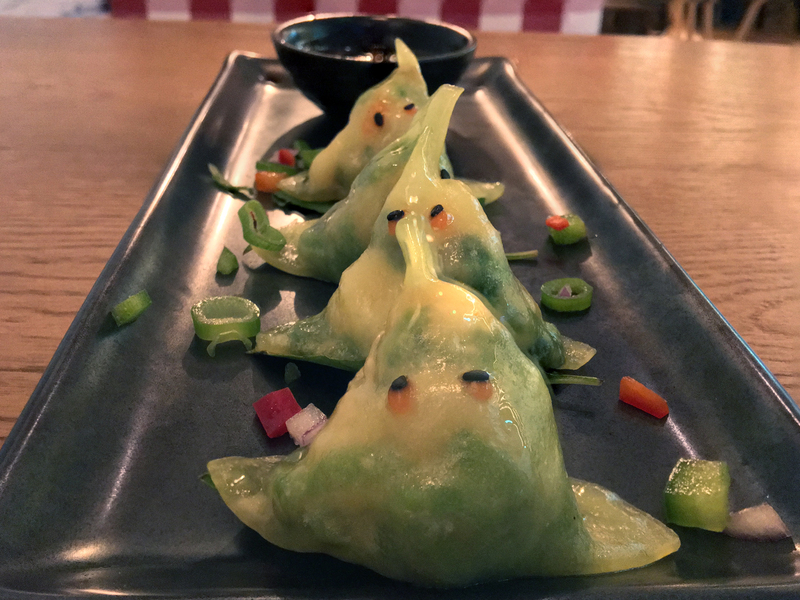 The ‘Pac Man’ dumplings will garner plaudits and Instaswooning purely for their Atari-dervied aesthetic. 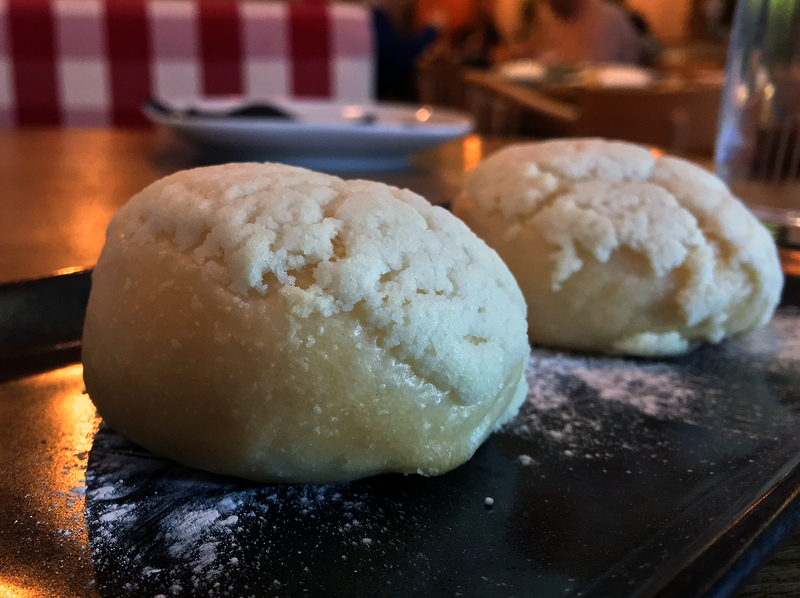 It’s undeniably charming, even if the dumplings in question are merely a succession of tweaks and variations on the classic har gau. There weren’t any earthshaking differences between the various dumplings, even when one dumpling allegedly had lobster rather than the chunky, moist and moreish prawn. The differences were, instead, rather more subtle with accents of bamboo shoots, ginger, mushroom and a light curry flavour from dumpling to dumpling. The opaque skins were as thin, sturdy and supple as the grease-free prawn fritter on the side was crunchy. 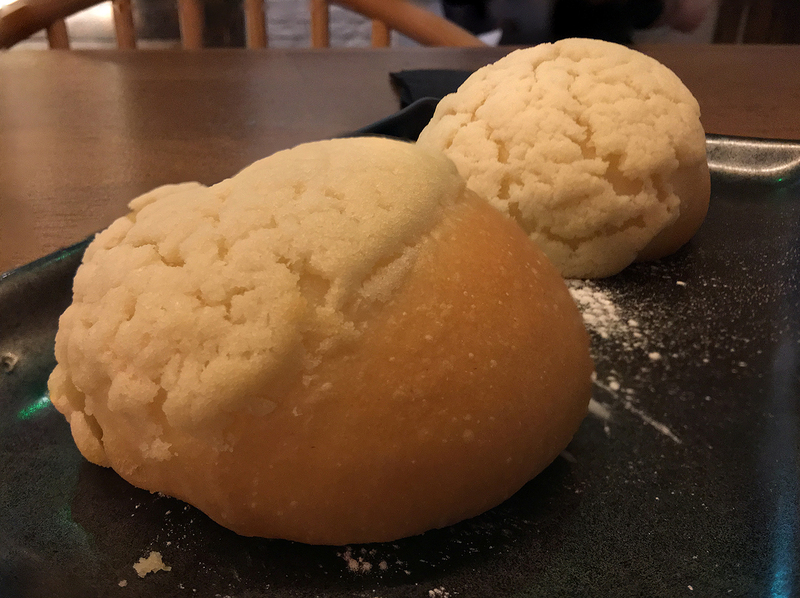 Think of these har gau as a playful evolution, rather than a dramatic revolution, and you’ll get along with them just fine. I fell out of love with the stodgily heavy, grease-laden and deeply uninteresting qualities of spring rolls a long time ago. Everyone could take a few lessons from Red Farm’s imaginatively carnivorous versions. Crisp, flaky, airy and oil-free pastry filled with meaty, sinewy pastrami with a hint of mustard makes for superb comfort food. The crunch of preserved cabbage melded neatly with the crisp pastry. It all sounds deceptively simple, but if it ever was then why has no-one else done this before? 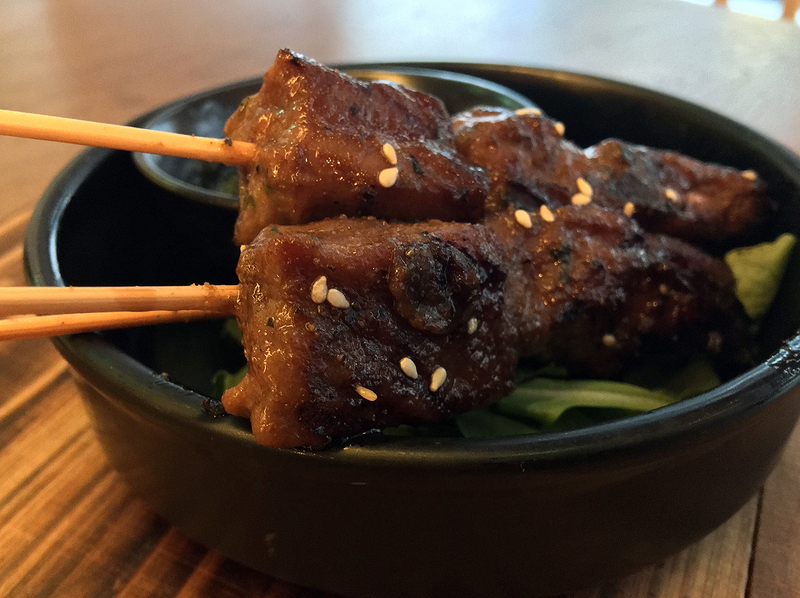 Cumin lamb skewers were tender, but with more of a bakkwa jerky-style sweet umami than the fragrant heat of cumin. These skewers weren’t bad by any measure, but they’re not going to displace Uyghur-style kebabs or yakitori from my affections any time soon. It’s cumin home. Well, not quite. Shrimp-stuffed chicken arrived in an unexpected form. 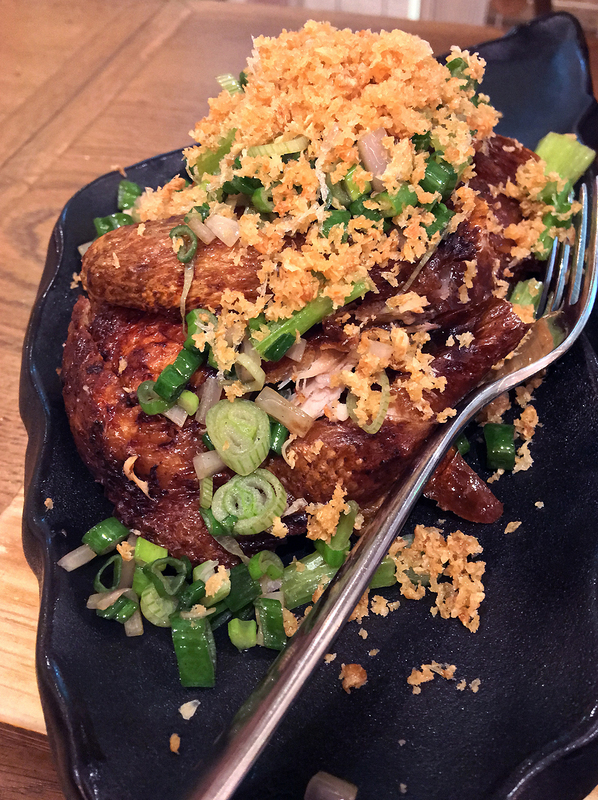 Dense, smoky and moist strips of chicken had crispy skin on one side and a thick, dense layer of prawn, studded with puffed rice, sat on the other. Although initially unconvinced, I was quickly won over by this unusual double-protein punch. The pairing proved surprisingly complimentary, with the crunchiness and moreish denseness of one mirrored in the other. 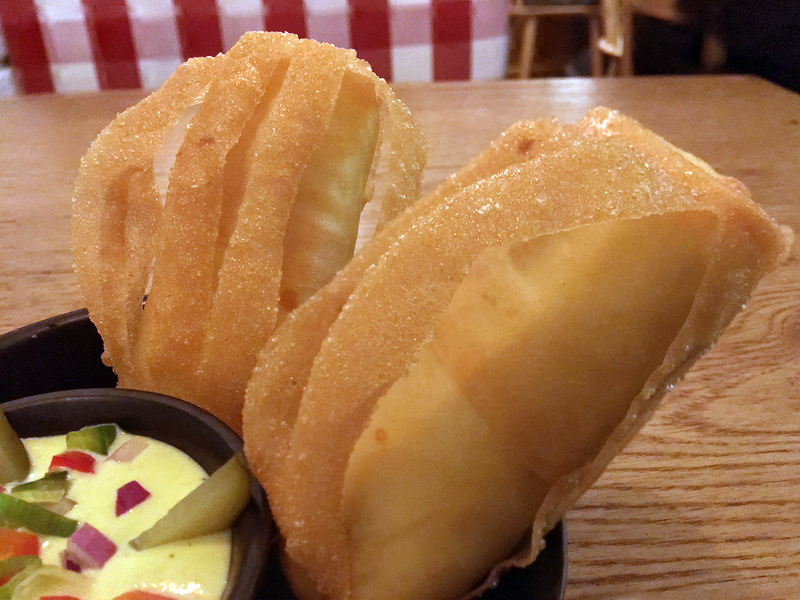 The accompanying dipping sauces shouldn’t be overlooked. The peppery umami soy sauce was unexpectedly winsome, but the pungent sauce based on fermented shrimp paste was even better. The custard bao was just as good as it was before. Red Farm sometimes has specials based around pea shoots. When it does, you should most certainly order and devour them without hesitation. 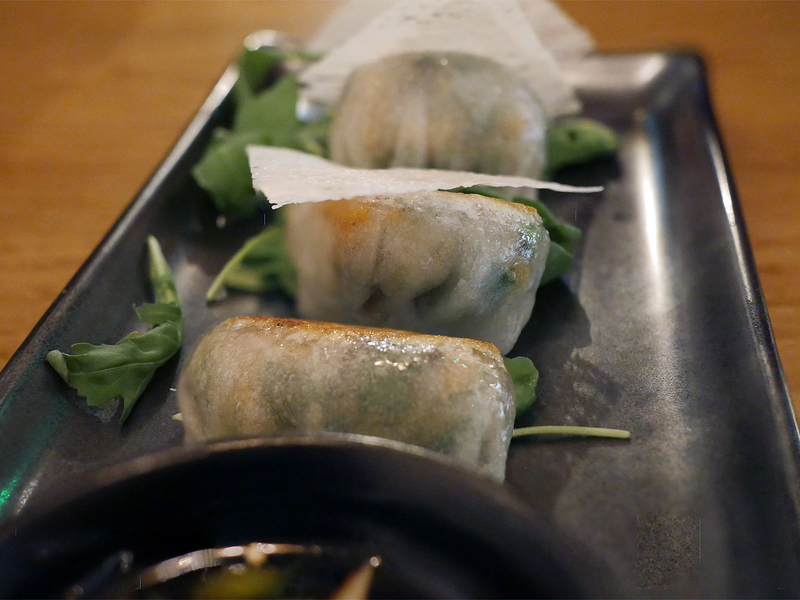 Dumplings filled with moist, firm prawns were given a sweet, crisp, moreish edge courtesy of the shoots. 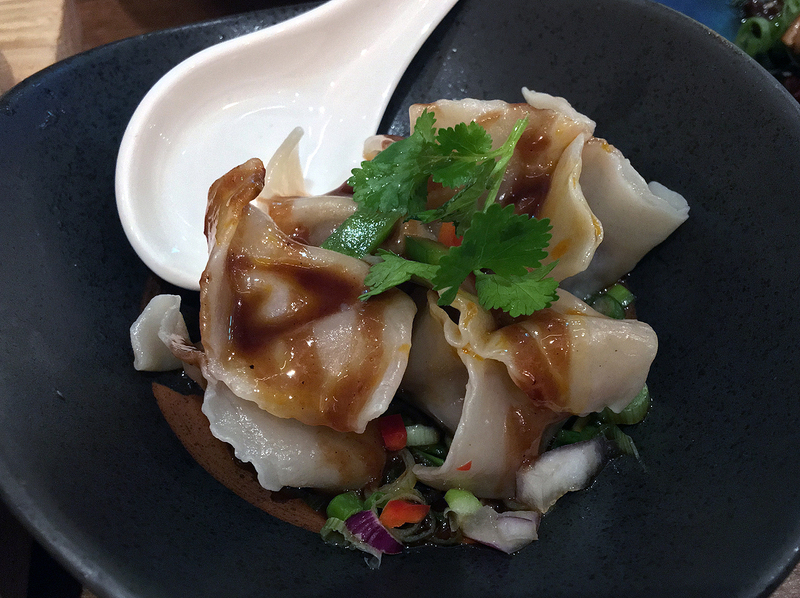 While somewhat similar to prawn and chive dumplings, a classic dim sum staple, these dumplings still managed to be distinctive and delicious in their own right – no mean feat given the centuries long art of making Chinese dumplings. 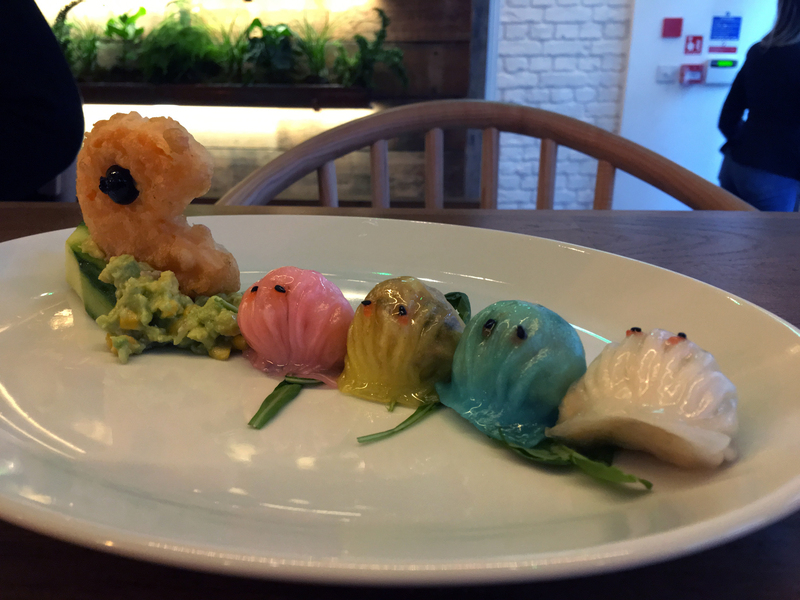 It’s a shame that so many people will gush over the Pac Man dumplings, while these little beauties will inevitably go under-appreciated. 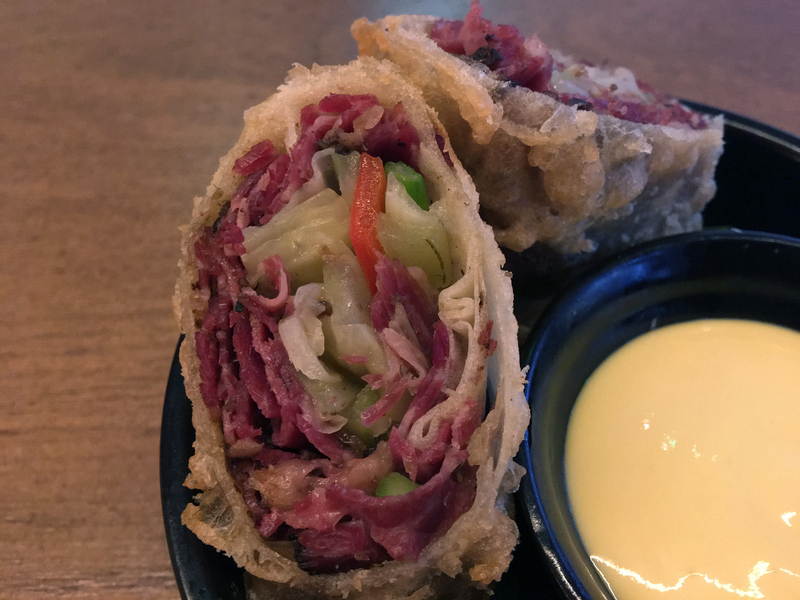 I was surprised to discover that the cheeseburger spring rolls didn’t use the same pastry as the pastrami spring rolls. 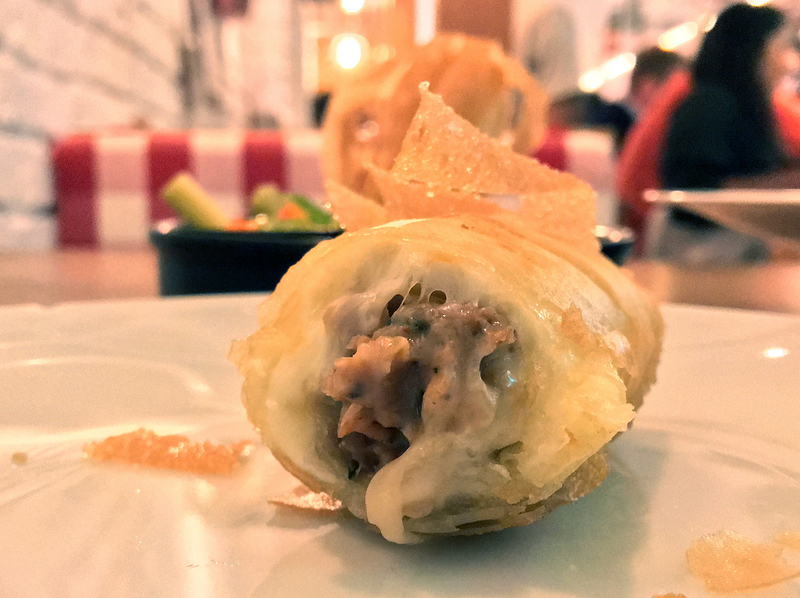 Thicker and crunchier, the pastry came filled with moist, coarsely ground cow that had an unmistakably beefy tang along with gently gooey cheese. It was all surprisingly credible and a damn sight more enjoyable than some actual, fully-fledged burgers in this town. While not quite as delectable as the cheeseburger tacos at Temper Soho in the pantheon of burger-derived non-burgers, it’s certainly far, far better than the misguided cheeseburger pizza at the nearby Temper Covent Garden. I’m apparently a literate adult, but I keep misspelling ‘rolls’ as ‘rools’. 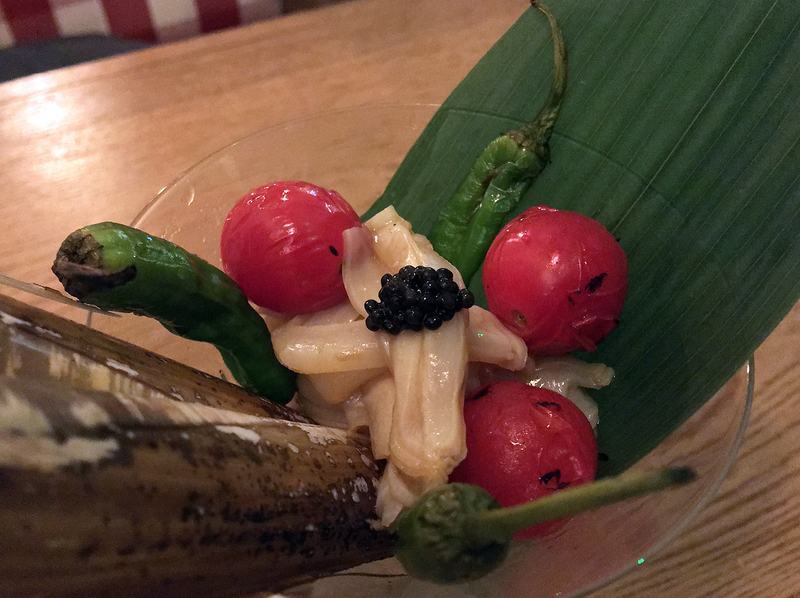 The vegetables in the razor clam salad are hardly worth mentioning, while the clams themselves were thinly sliced which negated much of their firm texture. It wasn’t a complete loss though as the clams absorbed the tart umami of the pickle brine to delicious effect. Served in a cocktail glass, for some reason. Three chilli chicken was effectively, to my mind, a hybrid dish of both gongbao chicken and three cups chicken. While not scorchingly hot, the three varieties of chilli did given the crisp yet tender chunks of chicken a surprisingly nuanced warmth. 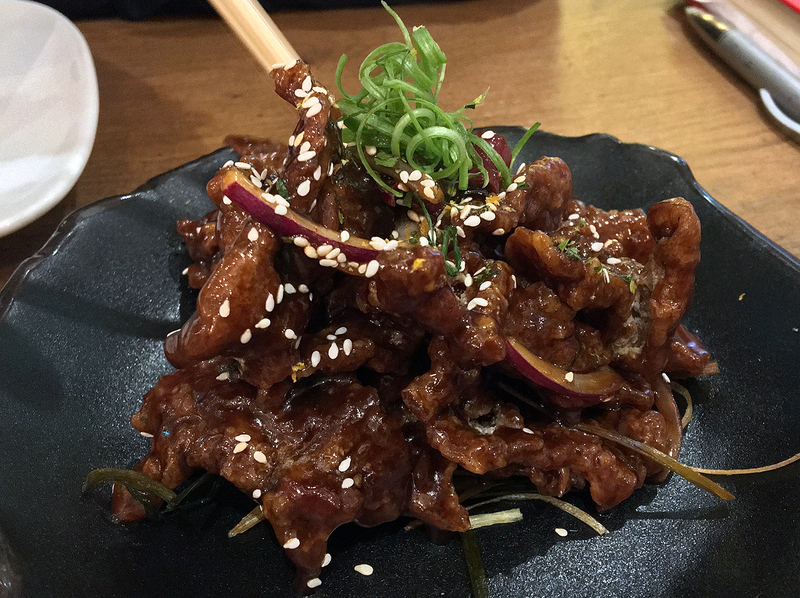 This was matched by a layered morishness, possibly the result of combining soy sauce, sesame oil and Shaoxing wine. Whatever the composition, the result was a profoundly delicious chicken dish pepped up further by the crunch of peanuts. 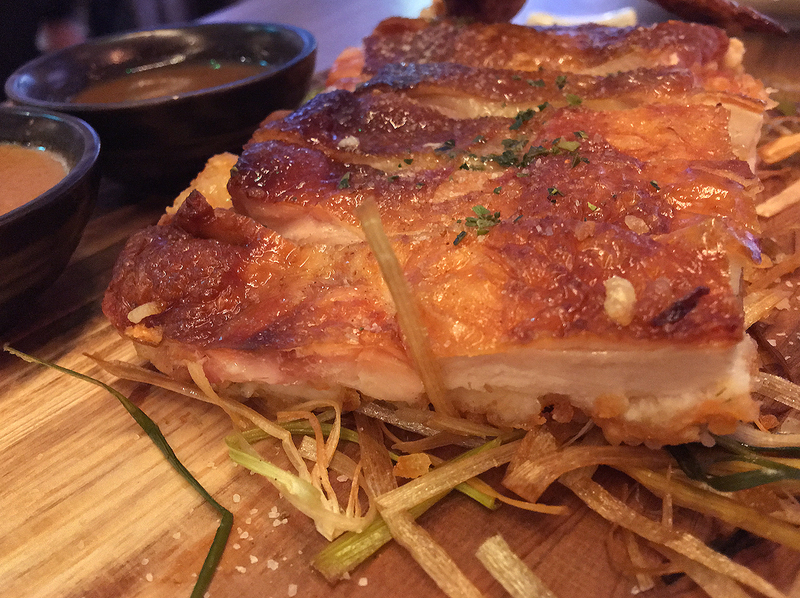 Not all chicken dishes are stiflingly dull. The custard bao was just as delightful as it was before. 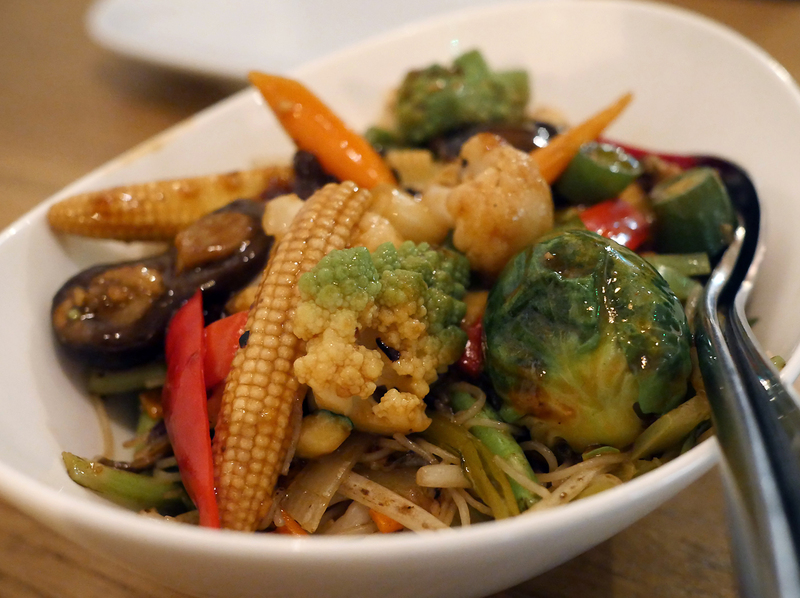 Vegetarian dishes play an outsized role in much of Chinese cuisine, but you wouldn’t know it from the drab veggie stir fries at most high street takeaways. Given Mandroid’s recent conversion to the one of the most unbearably, condescendingly smug conscientious eating cultures in the Western world, this seemed like a good excuse to dive headlong into Red Farm’s vegetarian dishes with the willing assistance of the carnivorous Sue Ellen. Dumplings filled with crunchy vegetables and peanuts were essentially a meat-free version of chiu-chao fan guo, a dim sum staple. The meat was hardly missed though, given the crunch of the earthy veg and the gelatinously soft yet sturdy dumpling skins. 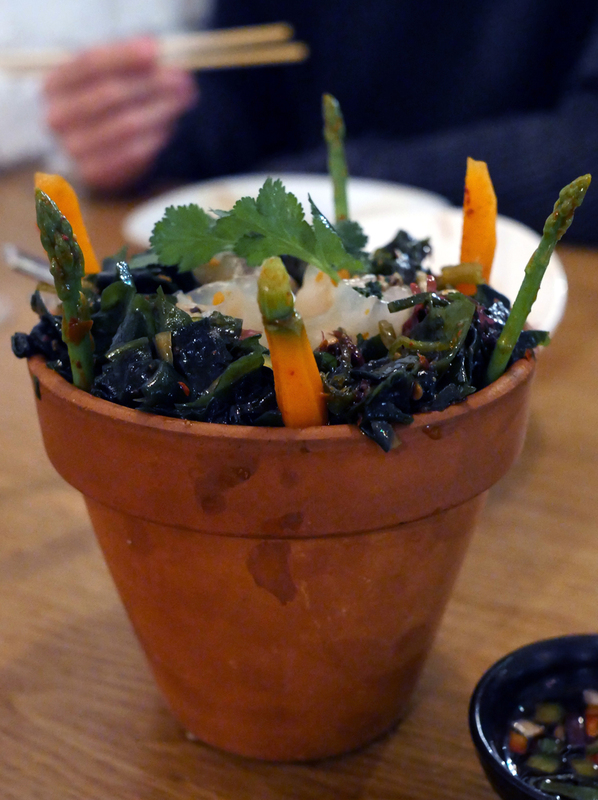 The three colour vegetable dumplings inexplicably arrived in a plant pot, raising fears that this dish was all show with no real roots. Although the thin, glossily opaque skins were slightly fragile, this was the only real flaw here. 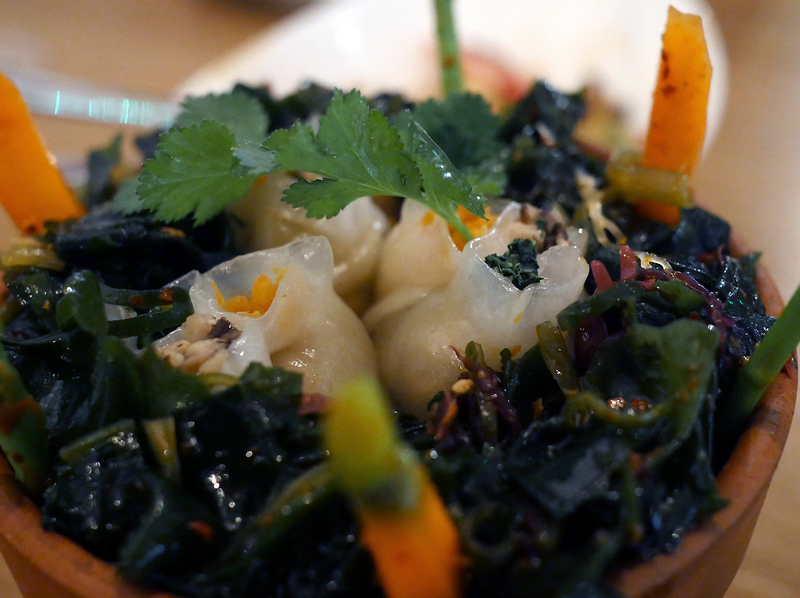 While each dumpling was dotted with three differently coloured vegetables, the dominant taste was of earthy black fungus. This was itself neatly complimented by the smooth, slippery and salty seaweed acting as the ‘dirt’ in the small dish balanced inside the pot. Thin vermicelli-style noodles had a moreish lick of sauce and a hefty if unimaginative selection of competently cooked vegetables. 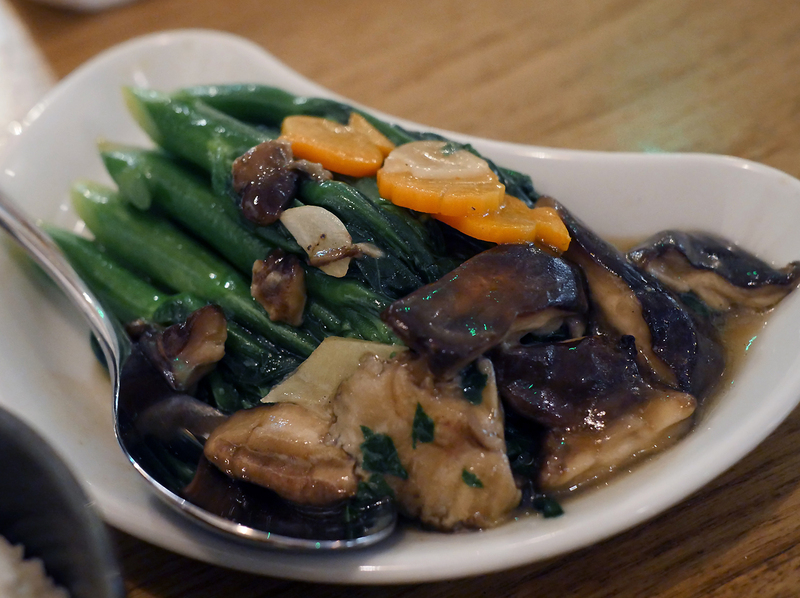 The best of the veg, by far, were the taut, slippery and gently mushrooms. A few more of those beauties would’ve gone a long way, a reality sneakily recognised in the sister dish of supple, umami wheat noodles boosted by the earthy moreishness of a whole forest floor’s worth of different mushrooms. 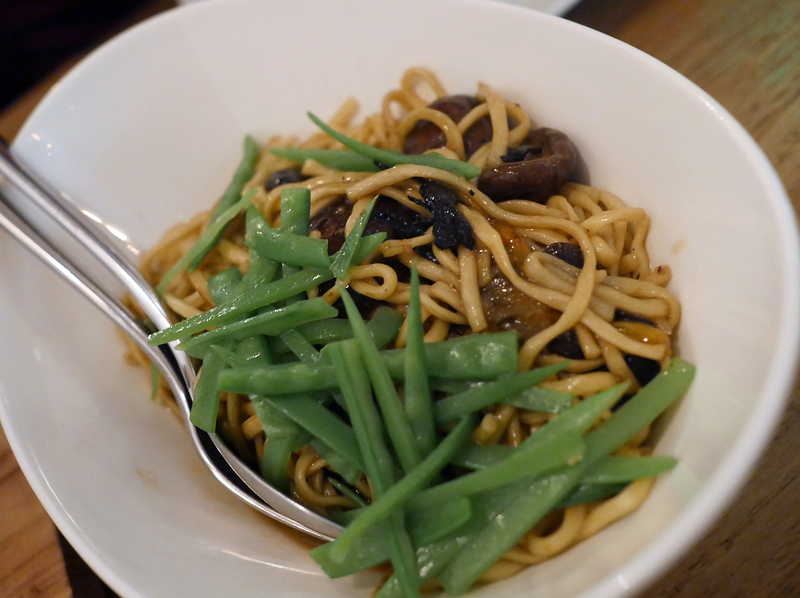 Opt for the mushroom noodles – you’ll thank me later. The crowd here is inevitably a bit touristy, but not overbearingly so. 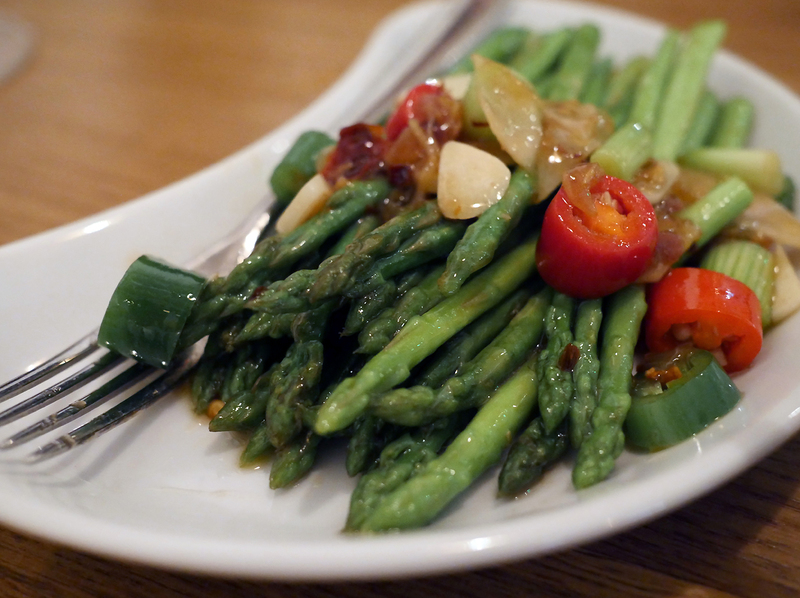 Firm reedy stalks of asparagus came in a surprisingly drab sauce of chilli and garlic. Gai lan proved to be a far more toothsome plate of greens, the bitterness of the firm stalks standing in sharp contrast to the sweetness of the supple shiitake mushrooms. A touch more garlic and the gai lan would’ve been close to perfection. Advertised as ‘Chinese broccoli’ on the menu. 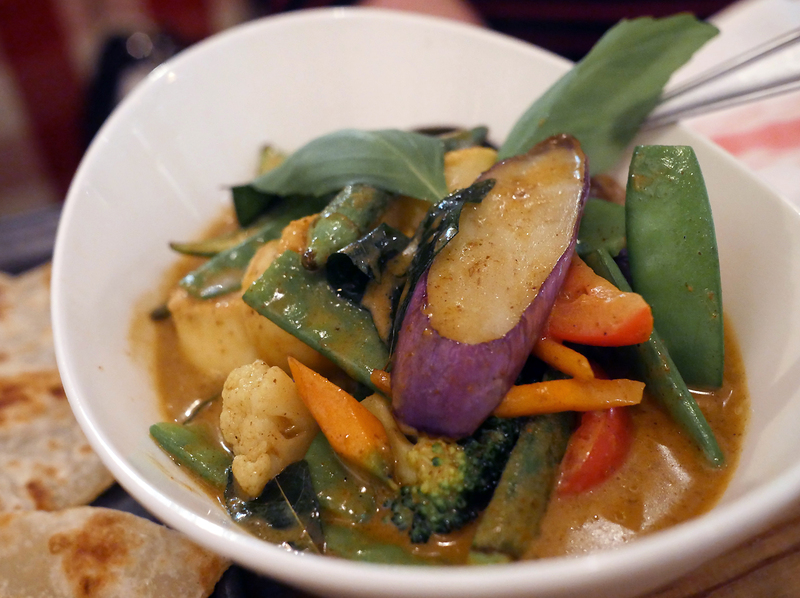 Red Farm’s vegetable curry had a sauce that was, unsurprisingly, reminiscent of the chip shop variety – thin and simply spiced, but not cloyingly sweet which was a small mercy. While competently cooked, the unimaginative selection of vegetables yielded the limelight to the large and soft yet sturdy scallop-shaped pucks of tofu. 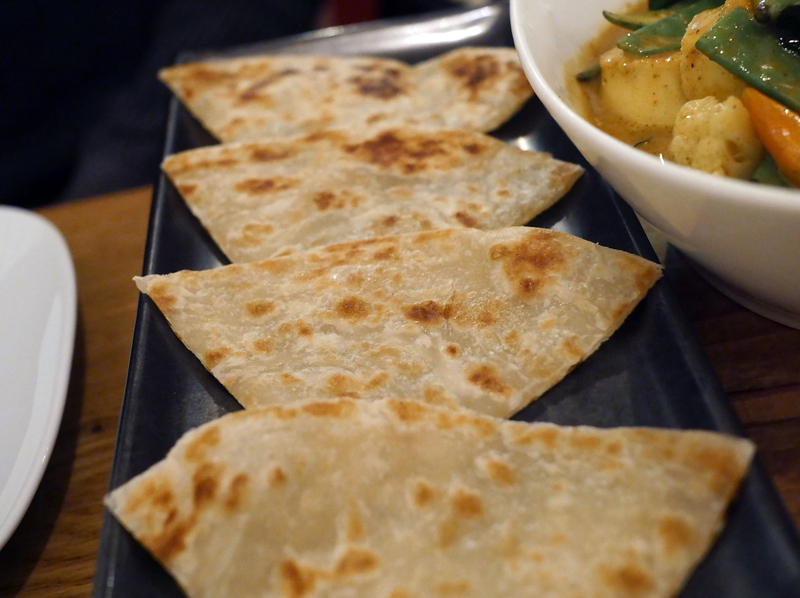 Wrapping these little beauties up in the winsomely soft roti, along with a drizzle of curry sauce, made for fine eating. It’s interesting that the only tofu dish on the menu isn’t advertised as such. A repeat appearance of the three chilli chicken was the one concession to the carnivorous tendencies of myself and Sue Ellen. While the yieldingly crisp texture of the chicken was still spot-on, some of the complex flavour and nuanced heat that had so bewitched me before was missing this time around. There was thankfully nothing disappointing about the custard bao, though, which remained as satisfying as ever. This review’s procrastination was brought to you, in part, by Doctor Who. I hadn’t intended to return to Red Farm so soon, but the need for a Covent Garden lunch at short notice with dining companion Inked Metal prompted this revisit. It turned out to be an auspicious and opportune time for a revisit though with the American caretaker/opening team having seemingly departed with the permanent crew now in place (as far as I could tell). 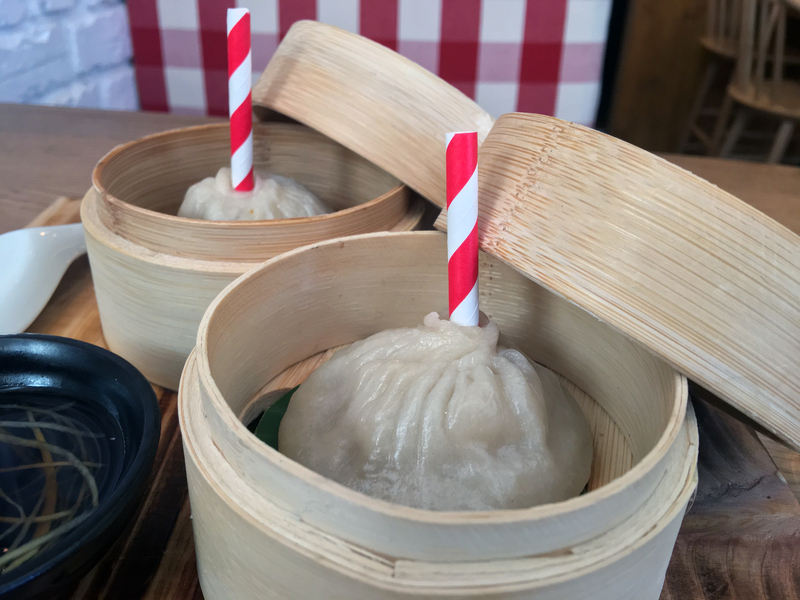 While Red Farm’s pork and crab xiaolongbao weren’t quite as profoundly umami as they had been previously, they were still wondrously moreish and meaty. As before, there was no danger of spraying piping hot soup over your shirt when piercing the thick yet supple skins, given the neat addition of a straw. Combined with the ginger garnish and the sweet tartness of the chinkiang-style dipping vinegar, these xiaolongbao remain the best I’ve had in London thus far – and that includes the soup dumplings at the nearby Din Tai Fung. Sorry DTFers. These xiaolongbao were simply soup-erior. Inked Metal insisted on ordering the crispy beef, but Red Farm’s version of this otherwise throwaway takeaway staple was far more pleasing than I expected. The caramelised sweetness and hints of Sichuan pepper meant these crunchy and chewy bovine twiglets were far more classy and enjoyable then they had any right to be. This review’s procrastination was brought to you, in part, by Mogwai. 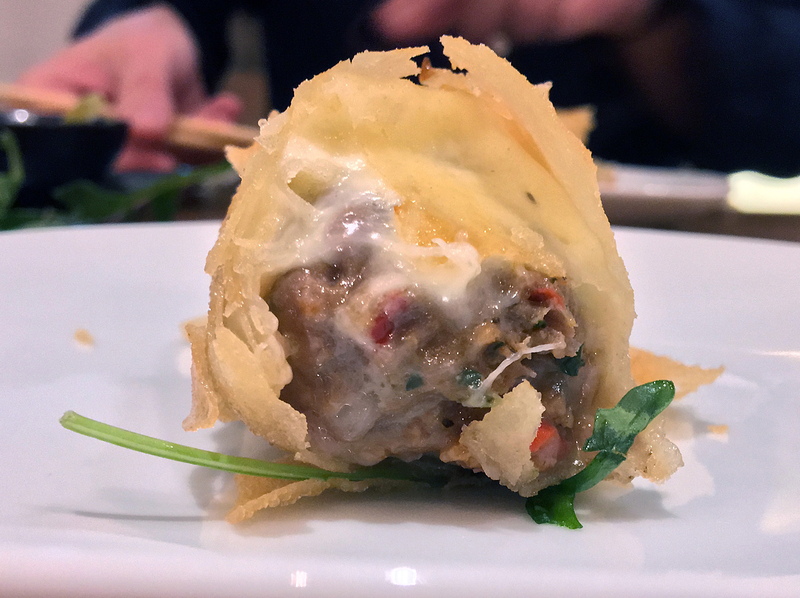 Red Farm’s beef dumplings may look like nothing more than super-sized manti, but the tangy, meaty filling had the chops to match the textural pleasures of the thick and supple dumpling skins. The mince in the cheeseburger spring rolls had a smoother grind than before. It was also less tangy, while the cheese wasn’t quite as decadently gooey as it had once been. There was still plenty of joy to be had though, given the contrast between crunchy pastry and moist, tender meat. 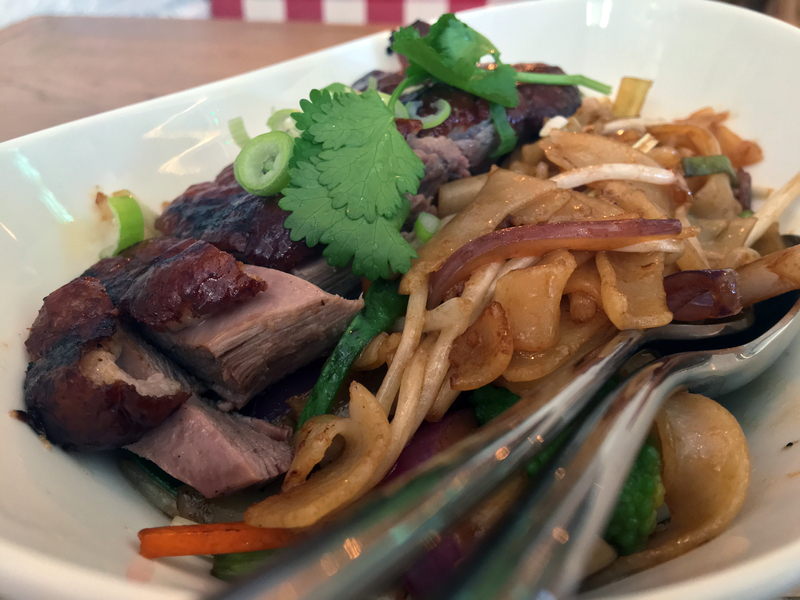 Ho fun rice noodles remained just as well-executed as before, but this time they came topped with slices of beef rather than roast duck. Each medallion and strip of beef had a lusciously dark imperial purple hue, a yielding tenderness and a rich umami. 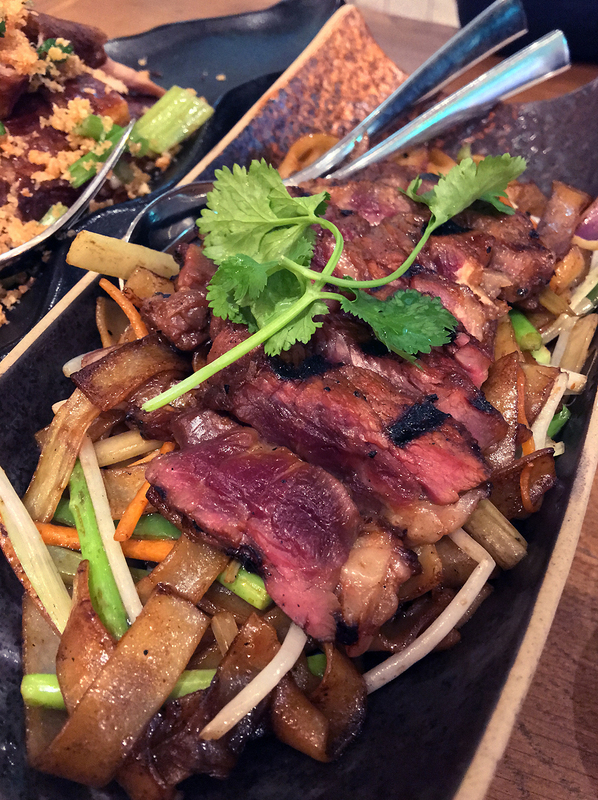 The beef was so exquisitely well-cooked, that I almost suspect it had been cooked separately from the stir-fried rice noodles – or perhaps glancingly seared in the wok at the last minute. In any case, it all made for a cracking dish. This may well have ruined all other beef ho fun for me. The double-sided prawn-chicken dish from my previous visit wasn’t available, so Inked Metal and I had to settle for the smoked crispy chicken instead. It was a merely so-so substitute for the textural and flavoursome delights of that chicken dish. While this chook was profoundly smoky, the skin wasn’t as crispy and the white meat not as moist as I would have preferred. Apologies for the iffy photo, folks. Despite this poultry hiccup, Red Farm’s standards remain – thus far – reassuringly high. Given that the cyclical nature of London’s restaurant market has once again led to a small uptick in the number of new restaurants focussing on China’s regional cuisines, it may seem odd to devote this much wordage to a quirky import from the US. Everything becomes clear though, once Red Farm’s cooking enters your mouth – this is a kitchen that is comfortable in its own skin. With the partial exception of their vegetarian dishes, Red Farm’s mix of traditional technique and inventive flair leads to some deliciously satisfying dishes. Red Farm’s grounded approach is just as important. 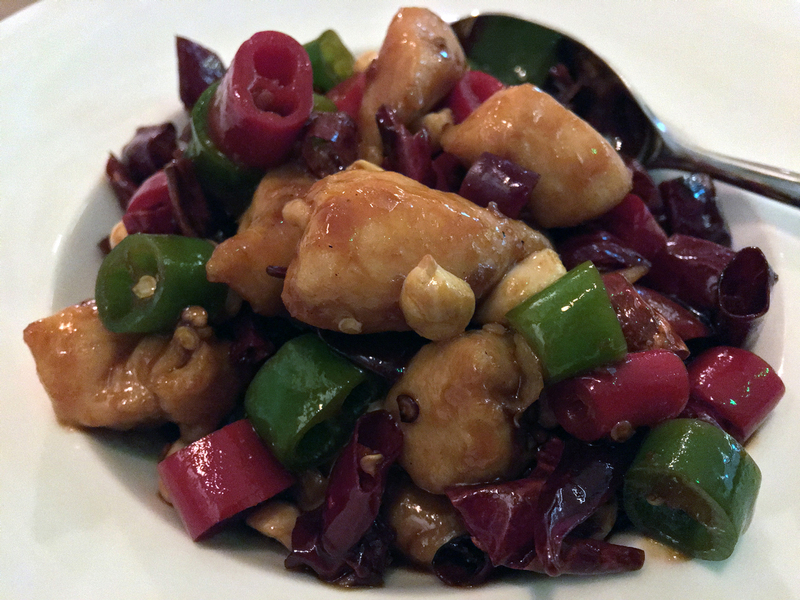 Considered and sophisticated, yet accessible and unintimidating, its menu may serve as a gateway drug for the lemon chicken crowd to a higher standard of Chinese food. Whether Red Farm’s own standards will remain sky high once the Yankee caretaker/opening team return stateside remains to be seen. I hope it does. Opening Hours: Monday-Thursday 11.45-15.00 and 17.00-22.30. Friday 11.45-15.30 and 17.00-23.00. Saturday 11.45-23.00. Sunday 11.45-21.30. Last orders 15 minutes before closing. Reservations? only taken for groups of eight or more. Average cost for one person including soft drinks: £50 approx. (£35 approx. if you order carefully; £70 approx. if you push the boat out). Tags: asparagus, bacon, bao, beef, burger, chicken, curry, custard, dumpling, dumplings, gai lan, kebab, lamb, london, mushrooms, noodles, pancakes, pastrami, prawn, razor clams, red farm, restaurant, review, roast duck, roti, spring rolls, Xiaolongbao. Bookmark the permalink.